MEXICO CITY, Mexico (CNN) -- Arrest warrants have been issued for another nine people associated with a fire at a day-care center in northwestern Mexico in June that killed 48 children, the state-run Notimex news agency said Saturday. 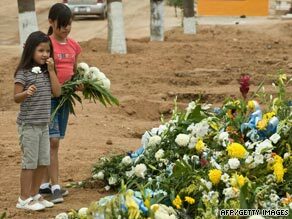 Two girls lay flowers during a funeral of one of the 48 children who died in the day-care fire. The warrants are for the owners and legal representatives of the ABC day-care center in the city of Hermosillo in Sonora state, which burned down June 5, Notimex said. Officials have determined that the fire started at an air-conditioning unit at a government-owned warehouse in the same building as the day-care center. Fourteen children remain hospitalized, Notimex reported earlier. The latest arrest warrants are the third group to be issued since the fire. On Wednesday, the Mexican federal attorney general's office ordered the arrest of nine public officials from the Mexican Institute of Social Security, which owned the day-care center, as well as private individuals connected to the facility. Two weeks earlier, Mexican officials announced they had ordered the arrests of 14 people who worked at the warehouse. Parents of the dead children and others have held demonstrations in Hermosillo and Mexico City to protest what they see as foot-dragging by authorities in punishing the responsible parties.